Product prices and availability are accurate as of 2019-04-17 02:13:58 EDT and are subject to change. Any price and availability information displayed on http://www.amazon.com/ at the time of purchase will apply to the purchase of this product. In this Building Websites with Squarespace training course, expert author Andy Anderson will teach you how to use Squarespace to design your own websites, blogs, and e-commerce stores. This course is designed for the absolute beginner, meaning no previous experience with Squarespace is required. You will start by learning how to plan your project, then jump into touring the Squarespace environment. From there, Andy will teach you how to create sites and cover pages, work with settings and design options, and create additional content. This video tutorial also covers setup options, including how to set up a paid account, a commerce page, and a blog. Finally, you will learn how to control the site, including how to add users, add a cover page, and adjust site navigation. 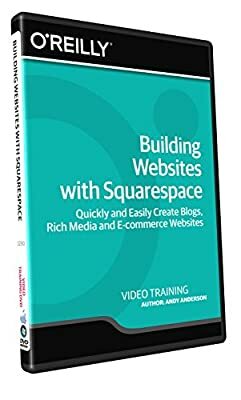 Once you have completed this computer based training course, you will have gained the knowledge necessary to create your own web design projects in Squarespace. Working files are included, allowing you to follow along with the author throughout the lessons.